For several years a pair of those singular little birds the water-ouzel have built their nest and reared their young on a buttress of a bridge, across what is called the Black burn, near Dalvey. This year I am sorry to see, that owing to some repairs in the bridge, the birds have not returned to their former abode. The nest, when looked at from above, had exactly the appearance of a confused heap of rubbish, drifted by some flood to the place where it was built, and attached to the bridge just where the buttress joins the perpendicular part of the masonry. The old birds evidently took some trouble to deceive the eye of those who passed along the bridge, by giving the nest the look of a chance collection of material. I do not know, among our common birds, so amusing and interesting a little fellow as the water-ouzel, whether seen during the time of incubation, or during the winter months, when he generally betakes himself to some burn near the sea, less likely to be frozen over than those more inland. In the burn near this place there are certain stones, each of which is always occupied by one particular water-ouzel; there he sits all day, with his snow-white breast turned towards you, jerking his apology for a tail, and occasionally darting off for a hundred yards or so, with a quick, rapid, but straight-forward flight; then down he plumps into the water, remains under for perhaps a minute or two; and then flies back to his usual station. 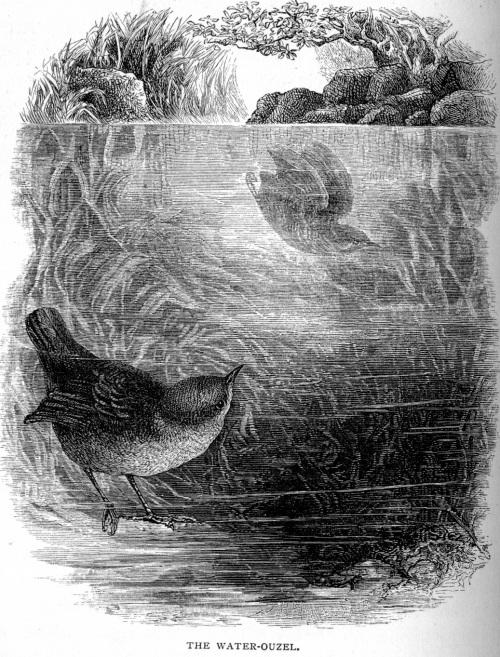 At other times the water-ouzel walks deliberately off his stone down into the water, and, despite of Mr. Waterton's strong opinion of the impossibility of the feat, he walks and runs about on the gravel at the bottom of the water, scratching with his feet among the small stones, and picking away at all the small insects and animalculae; which he can dislodge. On two or three occasions I have witnessed this act of the water-ouzel, and have most distinctly seen the bird walking and feeding in this manner under the pellucid waters of a Highland burn. It is in this way that the water-ouzel is supposed to commit great havoc in the spawning beds of salmon and trout, uncovering the ova, and leaving what it does not eat open to the attacks of eels and other fish, or liable to be washed away by the current; and, notwithstanding my regard for this little bird, I am afraid I must admit that he is guilty of no small destruction amongst the spawn. The water-ouzel has another very peculiar habit which I have never heard mentioned. In the coldest days of winter I have seen him alight on a quiet pool, and with out-stretched wings recline for a few moments on the water, uttering a most sweet; and merry song — then rising into the air, he wheels round and round for a minute or two, repeating his song as he flies back to some accustomed stone. His notes are so pleasing, that he fully deserves a place in the list of our song-birds; though I never found but one other person, besides myself, who would own to having heard the water-ouzel sing. In the early spring, too, he courts his mate with the same harmony, and pursues her from bank to bank, singing as loudly as he can; often have I stopped to listen to him as he flew to and fro along the burn, apparently full of business and importance — then pitching on a stone, he would look at me with such confidence, that, notwithstanding the bad name he has acquired with the fishermen, I never could make up my mind to shoot him. He frequents the rocky burns far up the mountains, building in the crevices of the rocks, and rearing his young in peace and security, amidst the most wild and magnificent scenery. The nest is large, and built, like a wren's, with a roof; the eggs are a transparent white. The people here have an idea that the water-ouzel preys on small fish, but this is an erroneous idea; the bird is not adapted in any way either for catching fish or for swallowing them. During a severe frost last year, I watched for some time a common kingfisher, who, by some strange chance, and quite against its usual habits, had strayed into this northern latitude. He first caught my eye while darting like a living emerald along the course of a small unfrozen stream between my house and the river; he then suddenly alighted on a post, and remained a short time motionless in the peculiar strange attitude of his kind, as if intent on gazing at the sky. All at once a new idea comes into his head, and he follows the course of the ditch, hovering here and there like a hawk, at the height of a yard or so above the water; suddenly down he drops into it, disappears for a moment, and then rises into the air with a trout of about two inches long in his bill; this he carries quickly to the post where he had been resting before, and having beat it in an angry and vehement manner against the wood for a minute, he swallows it whole. I tried to get at him, coveting the bright blue feathers on his back, which are extremely useful in fly-dressing, but before I was within shot, he darted away, crossed the river, and sitting on a rail on the opposite side, seemed to wait as if expecting me to wade after him ; this, however, I did not think it worth while doing, as the water was full of floating ice,— so I left the kingfisher where he was, and never saw him again. Their visits to this country are very rare ; I only have seen one other, and he was sitting on the bow of my boat watching the water below him for a passing trout small enough to be swallowed. The kingfisher, the terns, and the solan geese are the only birds that fish in this way, hovering like a hawk in the air and dropping into the water to catch any passing fish that their sharp eyesight can detect. The rapidity with which a bird must move to catch a fish in this manner is one of the most extraordinary things that I know. A tern, for instance, is flying at about twenty yards high — suddenly he sees some small fish (generally a sand-eel, one of the most active little animals in the world),—down drops the bird, and before the slippery little fish (that glances about in the water like a silver arrow) can get out of reach, he is caught in the bill of the tern, and in a moment afterwards is either swallowed whole, or journeying rapidly through quite a new element to feed the young of his captor. Often in the summer have I watched flocks of terns fishing in this manner at a short distance from the shore, and never did I see one emerge after his plunge into the water without a sand-eel. When I have shot at the bird as he flew away with his prey, I have picked up the sand-eel, and there are always the marks of his bill in one place, just behind the head, where it seems to be invariably caught. The terns which breed in the islands on a loch in the woods of Altyre, fully five miles in a straight line from where they fish, fly up to their young with every sand-eel they catch. I have seen them fly backwards and forwards in this way for hours together, apparently bringing the whole of their food from the sea, notwithstanding the distance; their light body and long swallow-like wings make this long flight to and fro less fatiguing to the tern than it would be to almost any other bird. Great numbers of terns breed every year on the sandhills. Their eggs, three in number, are laid in a small hole scraped amongst the shingle, or on the bare sand. Generally, however, they choose a place abounding in small stones; and their eggs being very nearly of the same colour as the pebbles, it is very difficult to distinguish them. The nests being frequently at so considerable a distance from the water, it has often been a matter of surprise to me how the young birds can live till they have strength to journey to the sea-shore. I never yet could find any of the newly-hatched terns near the nests, and am of opinion that the old birds in some way or other carry off their young, as soon as they are out of the egg, to some place more congenial to so essentially a water-bird than the arid ground on which they are hatched. During fine weather the terns never sit on their eggs in the daytime, but, uttering unceasing cries, hover and fly about over the spot where their nests are. All day long have I seen them hovering in this manner, with a flight more like that of a butterfly than of a bird. 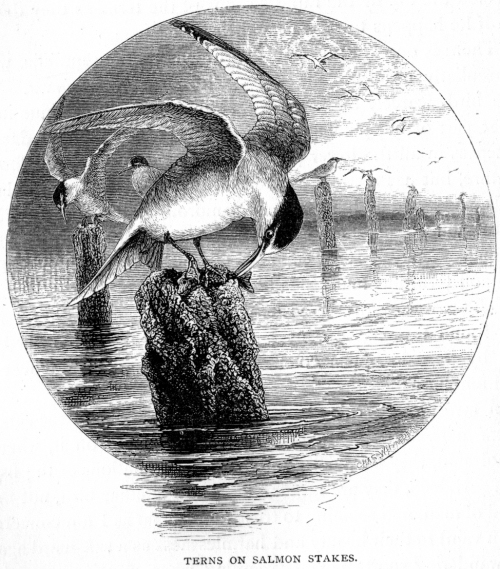 If a man approaches their eggs, they dash about his head with a loud angry clamour; and all the other terns who have eggs, for miles around, on hearing the cry of alarm, fly to see what it is all about, and having satisfied their curiosity, return to the neighbourhood of their own domicile, ready to attack any intruder. If a crow in search of eggs happens to wander near the terns' building-places, she is immediately attacked by the whole community, every bird joining in the chase, and striking furiously at their common enemy, who is glad to make off as quickly as she can. The terns, having pursued her to some distance, return seemingly well satisfied with their feat of arms. I have also detected the fox by the rapid swoops of the terns as they dash at him if he happens to pass near their nests. There is one kind of tern that breeds on the sandhills, which is peculiarly beautiful, the lesser tern, or Terna minuta. This little bird, scarcely bigger than a swift, and of a pale blue in the upper part of her plumage, is of the most satin-like and dazzling whiteness in all the lower portions. It is a most delicate-looking creature, but has a stronger and more rapid flight than the larger kinds, and when he joins in their clamorous attacks on any enemy, utters a louder and shriller cry than one could expect to hear from so small a body. Its eggs are similar in colour to those of the common tern, but much smaller. The roseate tern also visits us. I do not know that I have ever found the eggs of this kind, but I have distinguished the bird by its pale bluish coloured breast, as it hovered over my head amongst the other terns. A favourite position of the tern is on the stakes of the salmon-fishers' nets. Frequently every stake has a tern on it, where, if unmolested, they sit quietly watching the operations of the fishermen. Indeed, they are rather a tame and familiar bird, not much afraid of man, and seeming to trust (and, as far as I am concerned, not in vain) to their beauty and harmlessness as a safeguard against the wandering sportsman. Excepting when wanting a specimen for any particular purpose, I make a rule never to molest any bird that is of no use when dead, and which, like the tern, is both an interesting and beautiful object when living. These birds make but a short sojourn with us, arriving in April in great numbers, and collecting in flocks on the sands of the bay for a few days. They then betake themselves to their breeding-places, and, having reared their young, leave us before the beginning of winter.